A spring is a natural opening in the ground where water flows directly from the aquifer to the earth’s surface. The source of this fresh water is from seasonal rainfall that soaks into the ground, which is referred to as groundwater. Springs form when groundwater is under pressure and flows up through an opening called a spring vent, supplying flow to a river or other water body. A spring can occur individually or as a group of many springs. A spring is only as healthy as its springshed, which is the area of land that contributes water to a spring. This area includes much more than just the land surrounding a spring. For example, the Rainbow Springs Group has a springshed that covers several hundred square miles and extends into three counties. Your actions at home, which may be many miles from a spring, can affect the health of the spring and the water flowing from it. Find out if you live in a springshed — view map of generalized springshed boundaries. Florida’s springs and their associated rivers and bays have tremendous ecological value, and are home to countless plants and animals. Spring vents are windows into the aquifer, which is the major source of our drinking water. Additionally, the springs’ crystal, calm flows and constant temperatures make them an ideal spot for a variety of recreational opportunities. Some ways people enjoy their beauty are by snorkeling, scuba diving and kayaking. Many come seeking a glance of the springs’ most famous seasonal residents — the manatee. What makes a healthy spring? 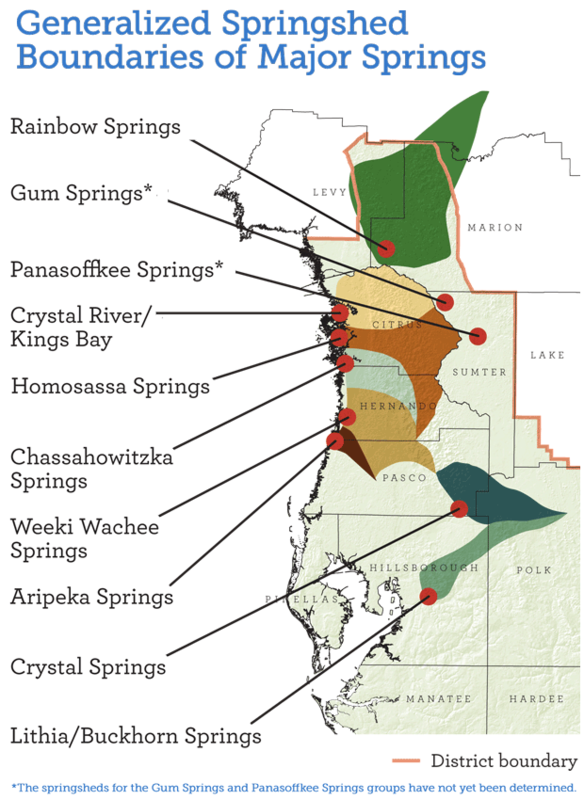 Springs throughout Florida and within the District vary widely in their size, ecology and human uses. However, there are four attributes that are common to healthy springs and can be used to assess their condition. They are flow, water clarity, aquatic vegetation, and fish and wildlife. Flow — The amount of water that discharges from a spring vent, or in most cases a collection of spring vents, is the primary feature of a spring system. Spring flow creates and maintains the spring run. Without adequate flow, the ecology and human use potential of a spring diminishes. Water Clarity — A defining characteristic of Florida springs is extremely clear water. High water clarity is a primary driver of the productive aquatic vegetation which supports spring ecosystems. Aquatic Vegetation — Another characteristic of most Florida springs is dense aquatic vegetation, which provides habitat for many organisms, removes nutrients from the water, and improves water clarity by filtering particles. Fish and Wildlife – Florida springs are also known for their abundance and diversity of fish and wildlife, including birds, turtles, alligators, and otters. Due to close proximity to the Gulf of Mexico, many District springs have especially high fish diversity since they are home to both marine and freshwater species. Several springs also serve as warm water refuges for the endangered West Indian manatee in the winter. The magnitude of a given spring is based on its discharge. First-magnitude springs discharge 64.6 million gallons per day or more. There are five first-magnitude spring groups in the District — Rainbow River, Crystal River/Kings Bay, Homosassa River, Chassahowitzka River and Weeki Wachee River. Together, they discharge more than one billion gallons of water per day. The District’s springs experts are working to improve habitat and water clarity in these springs and rivers.